Yesware was founded to empower sales teams to connect with customers more effectively and efficiently. Yesware links a sales rep’s email client to their CRM system and provides analytics to help them make smarter, more informed decisions throughout the sales cycle. Features such as email tracking, notification, and reporting help sales reps better understand the type of content that may further engagement. Time-saving tools such as email templates, scheduling, reminders, and mail merge help accelerate their outreach efforts and close deals faster. Deep integration with Salesforce allows teams to store communications and analytics in Salesforce, as well as view relevant customer data right from their inbox. The Yesware engineering team developed their app using Ruby on Rails and chose Heroku, part of the Salesforce Platform, to run their app for a number of reasons. Not only did Heroku provide extensive Ruby support, but the platform was well-regarded in the industry and was an easy way for them to get up and running quickly. Heroku allowed the team to focus on developing an innovative product and user experience, rather than get bogged down by infrastructure operations. As they’ve grown, Heroku has allowed Yesware to smoothly scale up without the need to re-architect their stack or take on new operational tasks. The team can incrementally deploy new features or new apps, and provision new dynos as their traffic and user base grows. The team uses multiple data stores including Heroku Postgres, which was their first database at launch. The majority of their data is now stored in Mongo. Heroku’s MongoLab Add-on made it easy for them to get started with Mongo, and they’ve since migrated to a stand-alone account with MongoDB. The team uses Resque and Redis to create and process job queues. They currently use APIs to sync data between their Heroku app and their Salesforce Sales Cloud org. Heroku has been well-suited to Yesware’s development methodology. The platform allows the team to quickly experiment and try different approaches, spin up a test environment for free, try different Heroku Add-ons, and see what fits for the project before settling in for the long-term with a couple of tried and tested technologies. Yesware chose to launch their apps on the Salesforce AppExchange Marketplace, which has since helped them gain a significant amount of lead volume — up to 60% increase in marketing-qualified leads. Now, approximately 35-40% of their leads come from through this channel. Access to this volume of leads, and building on a platform like Heroku, has enabled Yesware to develop based on actual market needs as well as better anticipate future needs. Becoming one of the most popular apps on the AppExchange – the leading enterprise apps marketplace – has helped with brand recognition, positioning Yesware as a market leader, and building visibility with a broader customer base. Sales teams can download the Yesware apps from the Salesforce AppExchange. Once installed, sales reps can leverage a set of time-saving tools that help them step up their email outreach and maximize productivity. Users create email templates that they can reuse and track in order to test and hone their messaging. They can schedule emails to be sent automatically at a specific time, or set reminders to follow up on important messages. The mail merge feature allows users to quickly send personalized emails to up to 200 recipients at once. A click-to-call feature allows them to place calls directly from their inbox with one click. 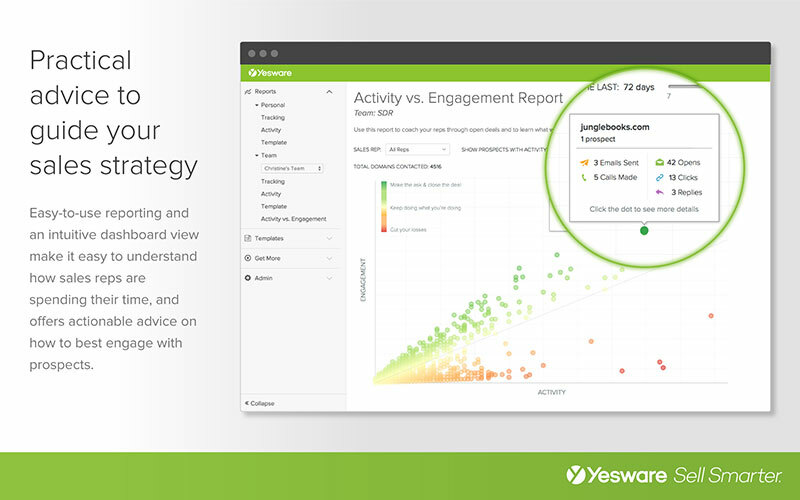 Yesware provides detailed email analytics that help sales reps identify the best performing emails, templates, and associated content. They can see who opened and replied to their emails, which links were clicked, and which attached documents were downloaded. They can even see which pages of the attachment were viewed, for how long, and how often, as well as know whether their recipient was using a desktop or mobile device. 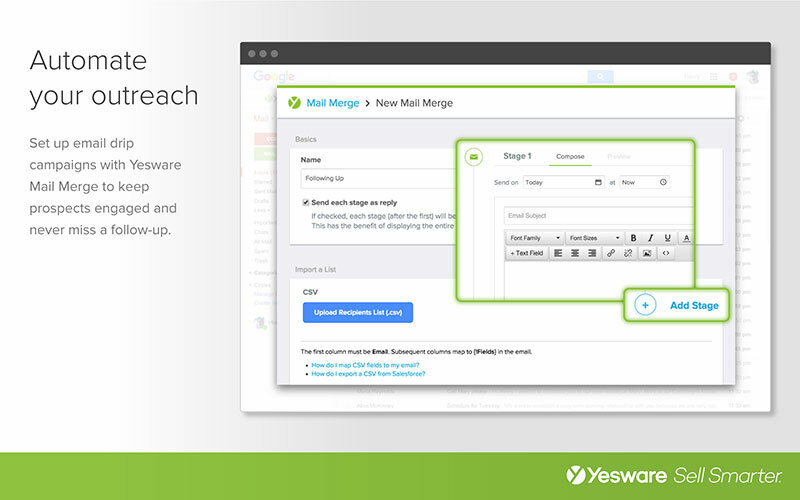 Deep integration with Salesforce brings the power of Yesware to another level. Yesware will capture outgoing and incoming email data and automatically log it in the associated Salesforce record, along with any calls made through Yesware’s click-to-call feature. Yesware makes Salesforce contacts accessible within Gmail or Outlook, and allows users to manage a single calendar across Google and Salesforce. An innovative Salesforce Sidebar feature displays the most recent activity and open opportunities, and allows sales reps to create new Salesforce tasks or contacts — without ever leaving their inbox. Conversely, users can view Yesware activity data inside Salesforce to better understand which activities led to closed business or spot red flags in the sales cycle before it’s too late. 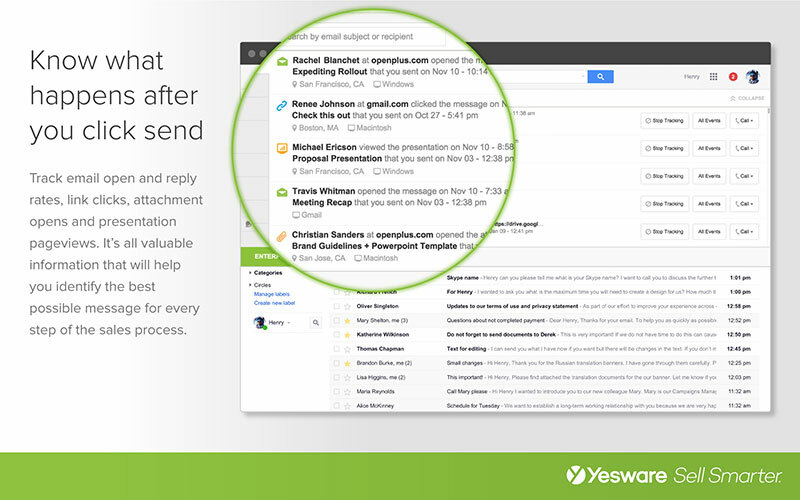 With Yesware, sales reps can sell smarter, right from their inbox. Is your team taking a micro-services approach to developing your app? Heroku allows the Yesware team to easily experiment, spin up and integrate new apps, and iterate their product as their business grows. For more information, contact Heroku today. Based in Boston, MA, Yesware is a venture-backed email productivity company that helps salespeople close more business. 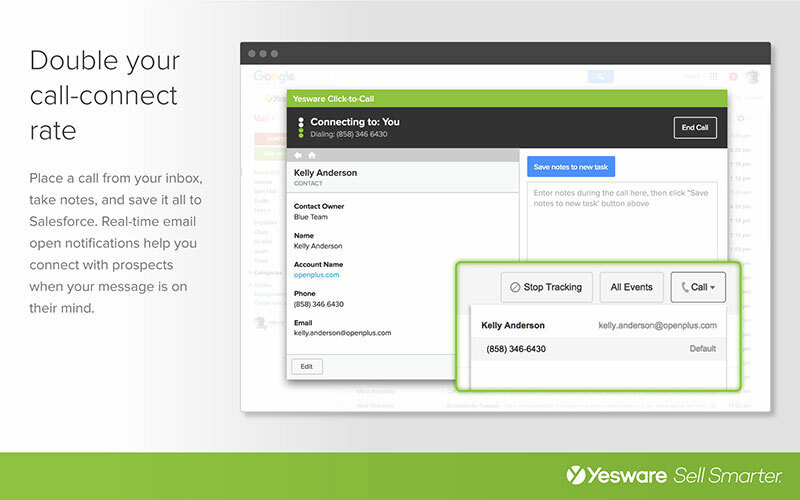 Integrated into Gmail, Yesware provides email tracking and analytics, customizable sales templates, CRM integration, and more to help salespeople communicate with customers more effectively. Additionally, Yesware supports the 1-1-1 model through Pledge 1%, a movement enabling tech companies to integrate philanthropy at an early stage and give back to their community. For more information, visit: yesware.com.